Telecommunications companies have a variety of outdoor equipment that requires site-focused organization in secure, easy-access structuresWireless carriers need a cost-effective way to install outdoor equipment on durable platforms and skids. Fibrebond builds innovative and reliable structures that protect people and mission-critical equipment. Therefore, to answer this demand, Fibrebond developed the Integrated Cabinet Skid. Starting in 2011, Fibrebond’s owners, directors and engineering team began development of the Integrated Cabinet Skid. The Integrated Cabinet Skid provides a reliable, durable platform for outdoor equipment. The design features a precast concrete floor with a structural loading of 150 psf and the Integrated Cabinet Skid’s galvanized steel frame is designed to meet up to 150mph windloads. In addition to the Integrated Cabinet Skid, Fibrebond developed steel platform frames as an option for sites requiring outdoor equipment. Steel platforms are manufactured with mounting holes to accept attachment of all approved options and the addition of uni-strut framing, while the cabinet’s floor-grate is recessed into the frame to provide a flush walking surface. Fibrebond’s Integrated Cabinet Skid and steel platforms provide a turnkey solution that reduces on-site construction timelines and costs. Its design provides space for additional equipment upgrades or expansions at site over time, and roofing options include a full or partial canopy. For an entire list of specifications and design options, please visit https://www.fibrebond.com/integrated-cabinet-skid for more information. Telecommunications companies and similar businesses have extensive need for structures designed to provide effective equipment storage, while answering a comprehensive range of operational demands. Fibrebond’s Integrated Cabinet Skids combine security and durability with cost-efficient, easily transportable design. 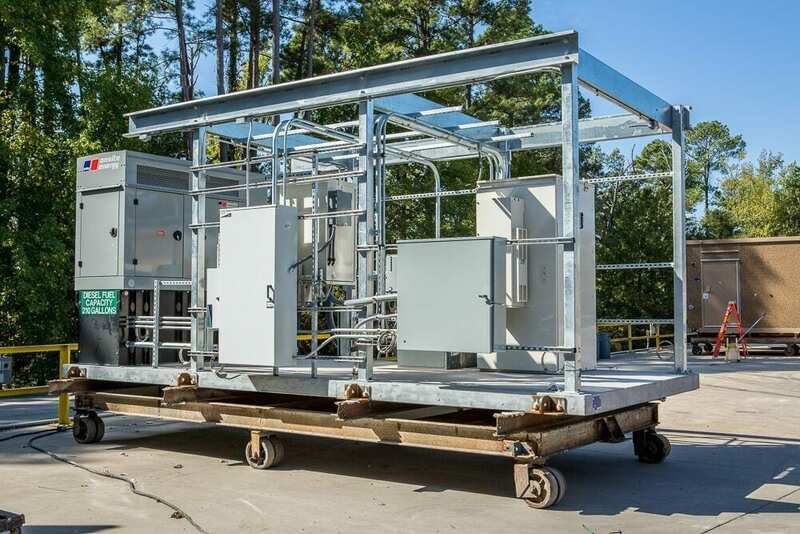 Fibrebond’s Integrated Cabinet Skid is the ideal turnkey product.The vendor base is consolidated, which alleviates inconsistencies between installation contractors—factors that ensure the skid’s status as one of the most reliable products on the market.